Here’s a yummy mango payasam recipe for Vishu feast! 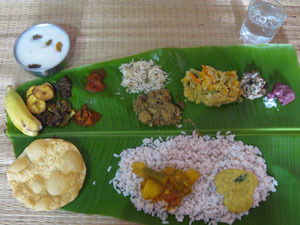 Both the recipe and pictures were contributed by Manju Jyothish. I just tasted it and it was awesome so thought of sharing it with you all..
1. Pressure cook the mango pieces adding about 1 cup water (or just enough water to cover them) for 1 whistle. 2. Chop the dried mango into small pieces.Cook them in enough water until done. Stir in the jaggery and mix well. Now add the pressure-cooked mango to this and cook well (varattuka). Stir continuously otherwise it will stick to the bottom. Now add the mango pulp and slowly cook until it reaches a thick golden consistency. Now add dried ginger powder, cardamom powder and mix well. Stir for a few seconds. Now bring down the heat and add coconut milk slowly while stirring. Cook for 2-3 minutes at low heat, stirring continuously. Do not let it boil otherwise it will curdle. Remove from stove. 3. Heat ghee in a pan. Add the sliced coconut and fry until golden brown. Drain on to a paper towel. Fry the raisins and cashews. Pour the ghee and fried items over the payasam. Close with a lid for at least 15 minutes. This payasam tends to thicken over time. Serve warm or chilled. I love any preparation with mangoes.. It looks very tempting..Nice presentation..
Payasam look delicious.I too love mangoes. One more nice way to have more mangoes;). That looks exquisite! Great pics!! wow very tempting payasam !! Mango Payasam looks delicious and so inviting. Great recipe. Looks delicious. Never tried Mango payasam will give it a try !! yummy n delicious! !nice presentation n click dear! The creamy pudding looks soo yumm..
hmmm….when I think of making a pineapple payasam, here comes a mango payasam recipe… looks gooooood… tell ur fren her pictures are as good as urs…. Hey Maya and Lakshmi, I’m so glad to have stumbled across your blog on my lazy trawl and hit a recipe for mango payasam plus a wonderful blog! The pictures tell me that the payasams are simply delish and I gotta try it. Since mangoes are in season and my family loves payasams, I definitely will! Gonna join your fan club to keep track of all the beautiful pictures and delicious recipes. Cheers! Woww soo tempting pudding,just drooling here..
so tempting payasam.. mangoes in any form is to die for..
New to ur space.. n happy to follow u. Rich and creamy,adipoli payasam..will surely try this. wow very creamy n yummm..
Mango payasam looks delicious I love mango. Oh my…what a delightful treat!!! Thanks for the link 🙂 I just sent it to the event..
wow…payasam looks delicious and tempting..:)….this is one of my favs…photos ellam adipoli ayittundu…. Maye, njna ethu vishunu thanne undakam ketto :), manga ente fav fruit anu, appol pinne athu kondu payasam undakiyalo, alochikumpole vellam varunne…. 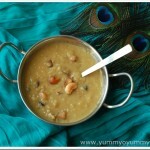 Lovely recipe…..Payasam with a diffrence… must be very flavourful !love to try it out ! I tried making it without the pulp, n it came out in a slightly darker colour but still tasty.